Garden trellises are versatile structures that can be used as screens, divide an area in the garden or landscape, function as a focal point, or be placed against a wall. They add interest to a wall, walkway, or garden path. 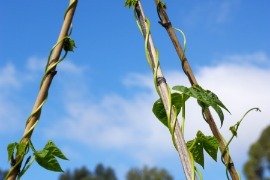 Trellises are used to train and display climbing vines and plants. Strategically planted flowering plants and climbing vines will cling to trellises as they grow. They are available in a variety of materials, designs, and sizes. Materials include wood, metal, and vinyl. 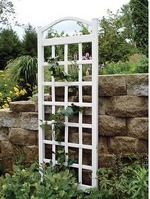 Trellises can be bought online or you can find them in garden centers. 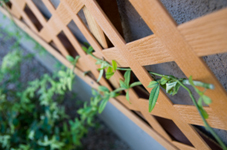 You can purchase wooden trellis panels that make it easy to customize trellis designs. Choose garden trellises based on the style of your garden, home, and landscape. Trellis Designs and Materials – What Are Your Choices? A wood trellis is less costly than a metal trellis. It can be stained or painted to match your home or landscape color scheme. A wooden trellis can be a single panel, or part of a landscape or garden structure, such as an arbor, gazebo, or planter. Wooden trellis panels make it easy to customize trellis designs to fit your needs. A metal trellis is a beautiful and elegant decoration or sculpture in the garden or landscape. This type of trellis is low maintenance and comes in a variety of materials (iron, steel, bronze, and aluminum) with unique finishes. 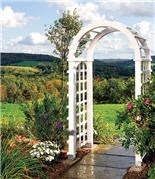 This trellis is right at home in tropical gardens, or perfect as a landscape accent to romantic cottage style homes. It is easy to make from wire and outdoor materials such as wooden poles, bamboo poles, sapplings, or twigs. A vinyl trellis is a low-maintenance, long-lasting structure. The vinyl material has the look of wood and the durability of metal. This vinyl trellis designs are available in many colors and styles. 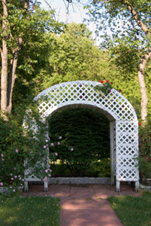 An arbor trellis is easy to design using trellis panels. Two panels are used for the sides, one panel for the top. Climbing vines and plants will grow up the side panels and spread over the top. Place against a wall to create interest and hide flaws. Accent a walkway in a front yard or back yard. 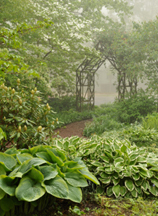 Group garden trellises together to create an attractive pathway. Arranging trellises can create an area for socializing and entertaining as well as add style and beauty to outdoor celebrations and events. Create shade in an area that receives a lot of bright sunlight. Add color and style to an area that is boring and drab.